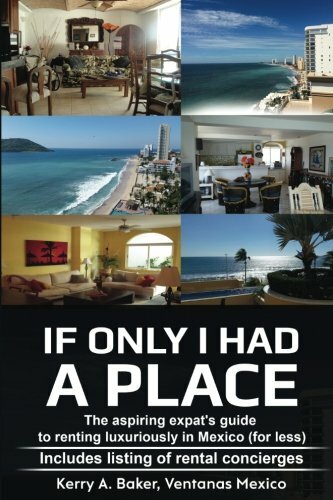 Whenever I go back to the States, I am always surprised how many people tell me I am living the dream; the double life of the part-time expat on the beach in Mexico while maintaining a place at home. “I would love to do that!” they tell me. I guess it surprises me because really anybody can. Looking at the circulation of International Living newsletters, it appears many people share at least the dream of beaches and Mexican night skies. There are plenty of logical reasons not to live in Mexico. Mexico is not for everyone. They have made the comment though, so I take it on face value that they really would love to. Why don't they? For many it's fear. I know. I felt it too. "Heaven is living in your hopes. Hell is living in your fears. It's up to each individual which one he chooses" - Tom Robbins, "Even Cowgirls Get the Blues." You never forget your first...apartment in Mexico that is. Ten years ago I certainly would not have thought I'd end up living along a Mexican beach. After moving to Denver from Virginia during the Recession, I did all I could think of to jump-start my career again in a new town, to start all over yet do the same thing. For several years after that my life consisted of meager contract work, interviewing (and all the hell that goes with that), volunteering on boards, attending continuing educational courses, networking and every other imaginable thing associated with job hunting. It was like selling his widgets at a loss, then telling everyone I would “make it up in volume,” I kept telling myself that even if I worked much harder for less money, certainly I would be rewarded in the end, right? Somehow, a terrible job for less money was going to fix things. Current reports confirm that many Baby Boomers never regained the ground they lost in their careers, home values and portfolios, even if the market recovered. If you were in your 50’s and lost your job, you were pretty much screwed for good, unless you thought up something radically different. The best a recruiter could hope for back then was the client giving at least a cursory interviews to our older candidates. That's if you have a very good relationship with client. Usually they wouldn’t even "waste" their time and quietly hired another search firm if you insist too much. Eventually I did change careers, moving into fund raising for charities using many of the same skills. Remembering those days as a recruiter, I know there is little convincing to be done with hiring managers regarding age. Either they are one of the isolated few who have an open mind, or they are part of this majority who don't. I'm not serving you up my personal bitter fruit. I'm recalling candid conversations I had with literally thousands of employer-clients over the course of my 15-year recruiting career. It's just reality. You can read all the cheery AARP advice you want and let people coach you on "right" responses to issues like energy level, technical skills and flexibility. It likely will not matter. That's why so many older people start their own businesses. For me, when every path seemed closed to me, it was a matter of whether I would acquiesce to a lesser, safer life doing just anything, or imagine a riskier, wildly different life. By middle age we should be fearless. Our children are grown. We have made or lost our fortunes. Many of our friendships have slogged to a slower journey of discovery. We are doing things for the 3rd, 4th or hundredth time even as the ramp gets shorter and shorter to try something new. It should be a time when life experience, skills we've honed over a lifetime and knowledge of ourselves should converge into the most creative period of our lives. Our final act should be a culmination of what we've learned and love about ourselves. It should be a time of letting go of the hand bar of the roller coaster of life and waving our arms over our heads. Finally it matters much less what anyone else thinks. By middle age, your ego should be tamed, awakened to the realization that other people aren’t paying near as much attention to your life as you thought they were. It has finally become your life. Our unique gifts and aspirations are the jewels within us that God intends us to find. They lay naked before us the older we get. Many people don't even look, afraid of where the discovery might take them. They are afraid that the passion might carry them off, or might even carry them away. Our society creates plenty of distractions from the real task at hand, finally living an authentic life. It gets harder to determine what you want from what everyone else thinks you should want. Some people who have contacted me about moving to Mexico share that they aren't telling anyone about their plans. They know they will be herded towards what is expected of them, that thing everyone else does. Money usually comes up as an excuse not to pursue a new lifestyle or career. In my own trek toward expat life, what surprised me was how solutions to the budget problems appeared so organically. Not every problems that get out of your way is a huge one. Many are every day annoyances that without a major lifestyle change, you never get around to addressing. Constantly going back and forth and haggling over phone bills and contracts with Verizon once I was coming to Mexico propelled me towards total internet phone service, which costs practically nothing. I dumped the $1,000 a month expense of owning a car for Uber and Lyft because paying what equates to $3,000 a month to use a car (based on drinving four months in Denver). That’s just stupid. Traveling with books became impractical, finally weening me off books for an electronic reader and cheaper e-books. I may only have 10 outfits in the closet due to luggage limits and storage considerations every six months, but they are 10 outfits I really like. The more some people have materially, the more locked they are on a lifestyle, even when it no longer fits their circumstances. So much for money buying freedom. If you are a part-time expat, every time you see something you are tempted to buy, you have to think of how much you’d like carrying it around or paying to store it. All these savings from lifestyle change occur in addition to the savings you realize through the lower cost of living in Mexico. Again and again, you have to go back and examine what activities will make our lives feel most authentic and exciting and test them against currents of familiarity and safety. Courage is its own reward. You may wake up relieved, in total alignment. You may wake up frightened because you know you are not aligned but are too afraid to change. One day you will not wake up at all. I read an excellent article in the New York Times about a triple amputee who made his palliative care his life work. One of the observations made was that at the end of life, rather than the existential clarity we anticipate, most often patients' days focus on quotidian beauty, small things. It was a relief to realize that going with a simple sigh might be enough. We die with only a whimper and according to hospice volunteers - that's perfectly normal. Yet that is still one more reason why it's what you do between now and then that matters most. Take a happiness test with one of the twenty tests devised by Penn State to measure your happiness, engagement, flourishing, meaning and satisfaction with life. "Do the Work" by Steven Pressman on getting "unstuck." "Essentialism" by Greg McKeon - a best-seller on the disciplined pursuit of less. Most recent: Once you come to Mexico, you can not just go to one Pueblo Magico, you can go to 100 of them. Next up: You don't need a word of Spanish to understand the best of Spanish contemporary music. Hola - I'm Kerry Baker and a partner with Ventanas Mexico which provides insight and resources to people considering expat life in Mexico. 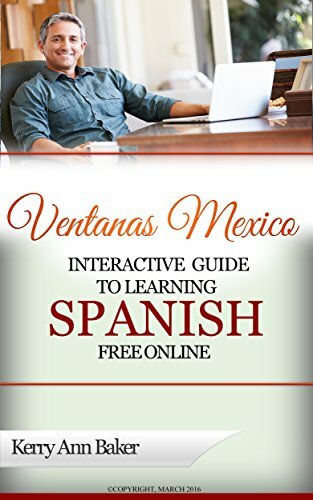 I am author of the "Interactive Guide to Learning Spanish Free Online," a curation of the best Spanish language tools on the web, and "If Only I Had a Place" for aspiring expats desiring to rent luxuriously for less. Here you can learn how to avoid the pitfalls and realize the advantages of renting as an American in Mexico.